During our stay in Istanbul we had the special pleasure to collaborate with the upscale Limousine Service Company Travelium who not only organized our Airport transfers, also a wonderful full day city tour of Old Istanbul. So exactely at 10.00 am our tour guide waited for us in the Lobby of our hotel. Together with her we joined the driver outside of the hotel and we tried to get all luggages inside the S-Class Limousine. Unfortunately not all bags did fit inside, so our driver organized everything that our luggage got from the Ritz Carlton Istanbul to the Raffles Hotel Istanbul within the company and while we were doing the city tour. And interestingly everything went excellent so that when we arrived at the Raffles, our luggage was already in the room! That's amazing, isn't it? Back to the tour: Our guide was the very nice and young Ülkü. She had an excellent knowledge of the city and we would not hesitate to take her again every time we are in Istanbul to see something new. 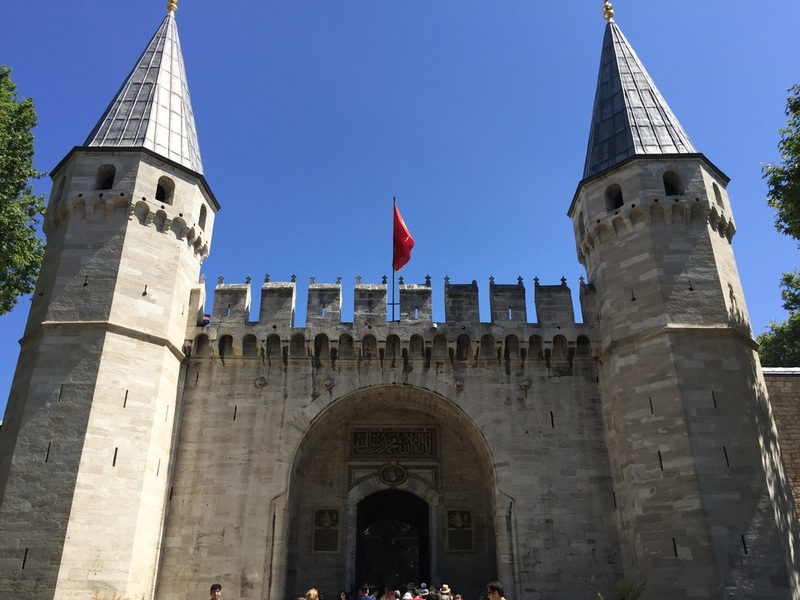 During our one-month trip we did many guided tours (eg in Lisbon and Rome), but in Istanbul we felt perfectly accomodated by our professional guide! The tour started at the Hippodrome of Sultanahmed where we left the Limousine and explored the area. From there we visited the Blue Mosque. It is one of the biggest mosques in the world and still in use for prayers (the Hagia Sofia is no longer in use). Ülkü explained us all details about the mosque and responded to our questions very professional. Afterwards we continued straight to Topka Palace, the place where the Sultans stayed before they moved to another palace directly on the Bosphorus. Again she explained us everything and gave us some free time inside the rooms and chambers of the palace, which was a great add on (there was absolutely no stress or hectic). When we finished the tour around the Palace we could have had the opportunity to have lunch but we decided to continue with the tour. So it was time to get inside Hagia Sofia - the most famous sight of Istanbul. I expected it to be bigger and more spectacular however Ülkü pointed out all important things and made the tour interesting and funny - what we both don't like is a boring tour! As a highlight of the tour, our guide kind of kidnapped us to an amazing place underneath the old town of Istanbul. This place was already a spot for the James Bond movie "From Russia with Love" and Ülkü also informed us that the new movie of Dan Brown was filmed here, so let's be excited! All in all we highly recommend to book a city tour with Travelium Istanbul and even more (as a secret hint) with their tour guide Ülkü - she is wonderful! After all these cultural sights we could have lunch or go to our hotel. As we already had dinner reserved at the Raffles we decided to continue to the hotel which was not the worst decision - the Raffles Istanbul is amazing! We were guests of Travelium Istanbul and did not pay for the tour. However all above written expresses our own opinion.